This camisole with shoulder pads adds smooth coverage, a touch of lace, and flattering definition to shoulders. Padded camisole is 100% nylon; machine wash. Imported. 2XL Black, 3XL Black, LG Black, MED Black, SM Black, XL Black are not available at this time. I wear it under my blouses and tops. I am so thrilled to find these camisoles. Have been looking for over a year so thank you. I can wear this camisole under all my clothing to help add just that little something to fill in for my slopping shoulders. Although the fabric is just a little thin and skimpy looking. The padding is almost non-existent and the fabric is stiff and cheap (maybe it will soften after washing). This will not do what I wanted it to do - hide my sloped shoulders. I bought two for myself and two for my Mom. I will be returning all of them. it doesnt fit true to size chart the fabric is cheap, there is no padding in the shoulders i was very disappointed in these garments. i bought three of them. i have one that i bought years ago , that looks similar but fits perfectly and is made out of better fabric and has small padding, i thought this was just like it . But i was wrong. Love the roundness it gives to my shoulders however, it does run big so wish I had sized down. I just didn't want it to be snug. Searching for light undershirt & it's a good price! My mothers doesn’t like her chest exposed, so this camisole will bring dignity. I had ordered this about 3 years ago and am happy with it. My mother is 92 and likes to wear a camisole under her tops. eeed a new camisole with shoulder pads so will give this one a try. I've been looking everywhere and couldn't find them and finally found them at Easy Comforts. Good deal, and looks to be useful. Had one. Very old. Needed new one. can never have enough of these. I bought one in each color since they were on clearance. It looks nice and useful. I have gotten them before . I have a fishnet swimsuit cover-up and I hope this will make the top more usable. camisoles with shoulder pads make all my tops fit and look better. These shoulder pads are not too big and look really natural. I purchased these long ago and I've worn them out. Camisoles with shoulder pads are difficult to find. Not available in most clothing stores in my area. This gives me more shape at the shoulders. Otherwise I look too rounded. size medium? different colors? are these available? BEST ANSWER: Thank you for your question. This item is available in sizes small- 3XL and offered in white, black and beige. We hope this information will be of help to you. What is the bust size for medium? BEST ANSWER: Thank you for your question. 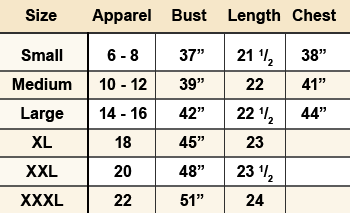 The bust size for medium is 39". We hope this information will be of help to you. BEST ANSWER: Thank you for your question. At this time we only have the comisole in cotton. We apologize for any inconvenience this may have caused. other color? do you have different material? BEST ANSWER: Thank you for your quesion. The Camisole only comes in 100% nylon and can be in white, black, or beige. We hope this information is of help to you. Do they come with larger shoulder pads? BEST ANSWER: The entire shoulder is lined inside with a very thin pad. I didn't notice much difference in the appearance of my clothing when I was wearing this. Thank you for your question. No, this item is not available with larger shoulder pads. We hope this information will be of help to you. No, the shoulder pads are very light and add shape to the shoulder. They are larger than the picture portrays them--Just right for me. what is the length of size medium? BEST ANSWER: Thank you for your question. From shoulder to bottom of the hem is 22" for the medium. We hope this information will be of help to you.